We know about the strict rules of the Royal family and their ban on the personal social media accounts, however, it doesn’t include the official profiles of the Royals couple or news about the family. Nexter.org prepared for you a list of main Royal family accounts on Instagram. The Duke and Duchess of Sussex’s Instagram account now have more than 3.4 million followers! Guinness World Records stated that they attracted more than one million followers in record-breaking time – five hours and 45 minutes. 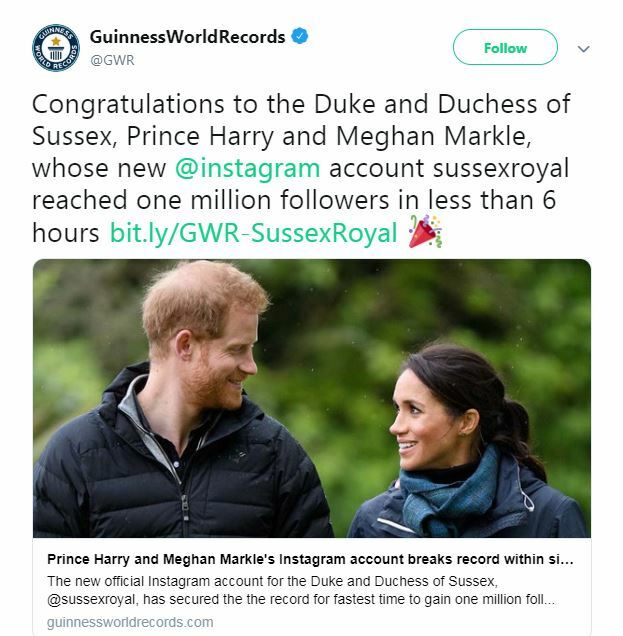 “Congratulations to the Duke and Duchess of Sussex, Prince Harry and Meghan Markle, whose new @instagram account @sussexroyal reached one million followers in less than 6 hours,” they wrote on Twitter. The previous record was held by Korean pop star Kang Daniel. The Royal couple, Meghan Markle and Prince Harry, make their own Instagram account @SussexRoyal to split from the Kensington Palace, Kate Middleton and Prince William with their own. Posting their first pics, Harry and Meg wrote: “Welcome to our official Instagram; we look forward to sharing the work that drives us, the causes we support, important announcements, and the opportunity to shine a light on key issues. A source told The Sun: “The couple chose all the pictures themselves and were very excited to open their own Instagram channel. We hope that this account will be full of cute baby pics soon. The Duke and Duchess of Sussex made their own Instagram profile and split from the Royal family – Kensington Palace – an official account of The Duke and Duchess of Cambridge, based at Kensington Palace. It’s the social media where Kate Middleton and Prince William share the key moment of Royal family life. The Sussex couple previously posted their pictures under the Kensington Palace account, but this era has ended. There is one more Instagram account shared by the Royal family – @theroyalfamily. Though it’s mainly about Queen Elizabeth II, it still has a lot of content on other members of the Royal family. Princess Eugenie is a granddaughter of Queen Elizabeth II and daughter of Prince Andrew and his former wife Sarah, Duchess of York. She also has an official account for the cool pics from her trips, events and daily life. He’s a prince of one of the wealthiest countries in the world – Brunei – and one the Sultan’s 12 children. There are a lot of interesting snaps on his profile that is worth checking out. The extremely adorable account of ‘Prins Carl Philip och Prinsessan Sofia’ – @prinsparet. The son and daughter-in-law of Sweden’s King Carl XVI Gustaf and Queen Silvia share a lot of cute pics of themselves and their kids almost every week. We know about the strict rules of the Royal family and their ban on the personal social media accounts, however, it doesn't include the official profiles of the Royals couple or news about the family. Nexter.org prepared for you a list of main Royal family accounts on Instagram.